Conozca al músico de reggae más famoso de Jamaica en un recorrido privado de día completo en el Mausoleo de Bob Marley. 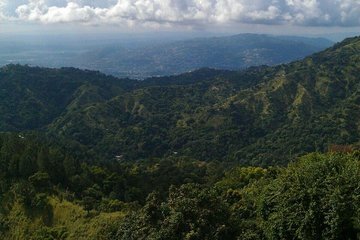 Visite la cuna y el mausoleo de la superestrella, situados en Nine Mile, Saint Ann Parish, y haga una visita con guía rastafari. También pasará a través de Fern Gully a lo largo del camino. Incluye las entradas, conductor privado y el traslado de ida y vuelta a Ocho Ríos. Después de la recogida por la mañana en su hotel de Ocho Ríos, relájese en su vehículo privado con aire acondicionado para el recorrido de 1,25 horas en coche a través de la selva tropical en Saint Ann Parish. Pase por pequeños pueblos a lo largo del camino y disfrute de la perspectiva de la vida diaria en Jamaica. Además, pasará por Fern Gully, hogar de abundantes especies de helechos, flores y árboles. El conductor ofrecerá comentarios informativos sobre la historia de Jamaica mientras se abre camino hasta el remoto pueblo de Nine Mile, lugar de nacimiento y de descanso final de Bob Marley. A su llegada a Nine Mile, tendrá tiempo para pasear por el pueblo y ver algunos de los premios y sellos discográficos de Bob Marley. A continuación, únase a un guía rastafari para hacer una visita a Mt Zion, donde Marley vivió de niño y fue enterrado con su guitarra. Al terminar la visita le llevarán de vuelta a su hotel o al puerto de cruceros en Ocho Ríos. Anyone coming to Jamaica needs to go on this tour. It was very interesting to see the home Bob grew up in and to see al lot of the photos from his family. There was also a reggae band there playing his music and our tour guide was great sharing all of his knowledge on some of the inspiration behind Bob Marley's music. One thing...it is a LONG and rough trip to get there! This was a great tour! It was very interesting and informative. My husband and I really enjoyed it. Henry was our driver and he was great! This trip was amazing. The journey up the mountains to see where the legend was born and laid to rest is an experience like no other. Our driver Fabian made it an even better experience!! You won’t regret it! This was a great trip. We were picked up at our hotel. The drive was comfortable and scenic. The driver was friendly and helpful. We arrived at Bob Marley's place quite early which I'd recommend as it's less busy get there before the big tours from MB...pick a day when there are less cruise ships in if you can This is a must do tour! Our private tour guide was very knowledgeable and catered to our every need. The hour long road trip from our resort in Ocho Rios through Browns Town was just as much fun as the tour itself. I'm honored to have been able to experience their culture and ways of live. I can't wait to go back! Highly recommended if you are a fan of Bob Marley. The trip takes 1 hr 20 mins by taxi on winding roads. Stunning views of the interior hills and valleys. Driving through small villages and getting a glimpse of how the majority of people live in Jamaica. A totally different world from Ocho Rios. The Mausoleum is thoughtfully done and the visit with one of the guides is interesting. You only need an hour there. Our driver, was fantastic - careful, thoughtful and very knowledgeable. The tour was right on time. Dr. Fun was there to meet us. The tour was fun and informative. We really enjoyed our day and our guide went the extra mile to ensure everything was perfect! I would recommend tour! And would not hesitate to book with them again.